Going into yesterday the basic plan was: 'Short term bullish bias if the 68.25-70.75 zone holds or it could turn neutral again. Holding above the 81-82.25 micro bull/bear could see a squeeze higher.' The test lower in the morning didn't quite make it to the 68.25-70.75 zone though left a poor low where shorts got trapped. You can clearly see below the early attempts to test the micro bull/bear failed until the fourth attempt where we got the short squeeze - seen by the single prints in the profile above. Overnight so far the market has been in a tight range and has tested the 2702.75-04.75 zone with a range of 2692.75-02.75 so far. CPI is due at 07:30 ET which has potential to be a catalyst for some action if there are any surprises versus consensus. 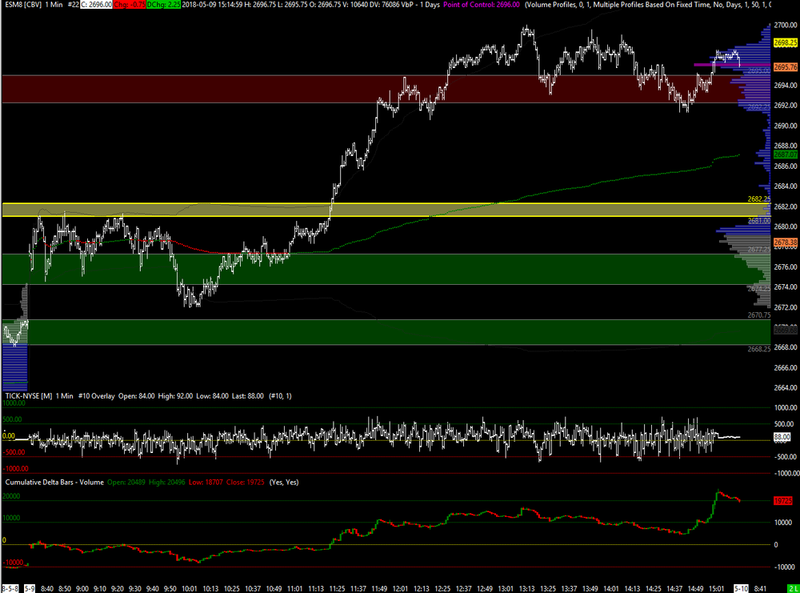 I'm using Initial support at the 2690.50-93.25 zone and resistance at 2702.75-04.75. A break below 2690.50 could see the single prints filled in from yesterday and retest the breakout area. Broken support above then becomes resistance on any move back up. If things turn really negative and yesterday's low get taken out we could see a more serious liquidation to challenge last Friday's breakout, though we'd need some very negative news to do that today. If initial support holds and buyers push through initial resistance, the next target is the 2716.75-20.50 zone. Today's zones of interest are below. Yesterday's prominent VPOC at 2696.00 could also act as support if buyers have control again today.